The Twister block is simple. 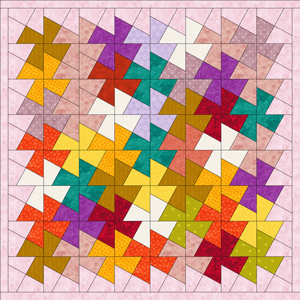 The true beauty of the design comes out when the block is repeated and then colored on the quilt in such a way to create the overall design. 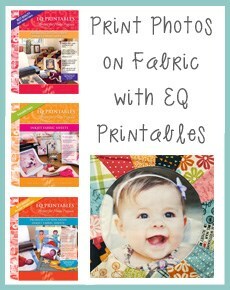 It’s a great scrap quilt, and easy enough for an EQ beginner to design and sew. On the Create a new project tab type: Twister. Click OK.You’re now ready to create the design, starting by drawing the block. 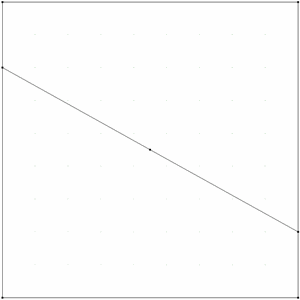 Looking at the ruler, draw a line from 1″ down on the LEFT side to 3 1/2″ down on the RIGHT side. 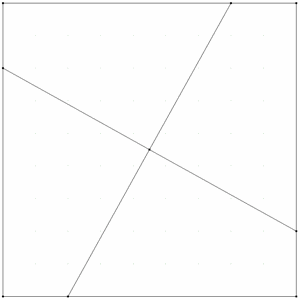 Draw a second line from 1″ over on the BOTTOM to 3 1/2″ over on the TOP. That’s our block! 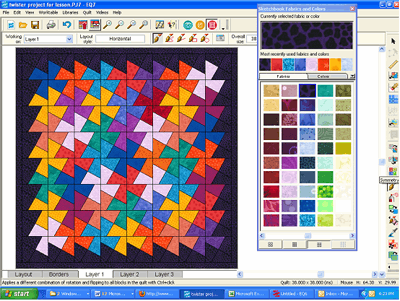 Looks like nothing at all, since the design is really formed when the block is repeated, then recolored on the quilt. Click the Set Block tool. Your uncolored Twister block appears here. Point to the quilt, and CTRL+click. Your Twister block drawing will set in all spaces at once. 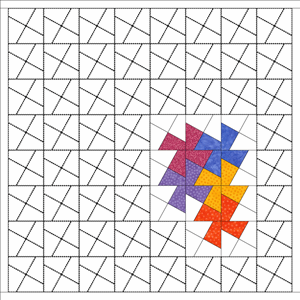 Tip: To find a color you’ve used previously somewhere on the quilt, use the Eyedropper tool. 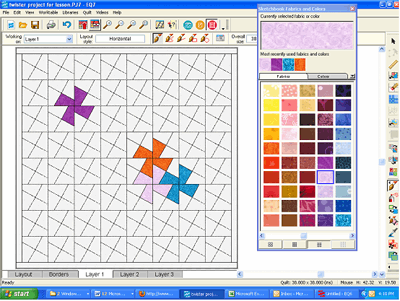 When you get to the edge of your quilt, you may want to use the Swap tool to color everything that is not colored (the edge patches) the same color, to form a background for your design. Click Add to Sketchbook to save your original coloring. 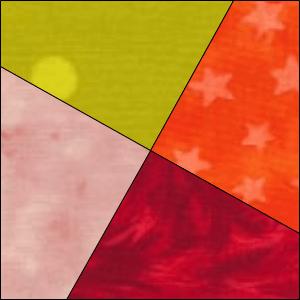 Once your whole quilt is colored, it will be very easy to recolor the pinwheels, to change the look of your quilt. You may want to try out the Random Recolor tool. This tool is a fun way to discover potential new color schemes. But it takes some real understanding, and experimentation. The Random Recolor tool is not on your toolbar by default. To add it to your toolbar: right-click the QUILT toolbar on the right side of the screen > choose Add/Remove tools > click to select the Random Recolor tool. Click the Random Recolor tool. Click on the quilt. 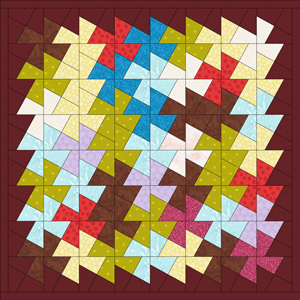 You’ll see a new random coloration of your quilt. NOTE: The greater the variety of fabrics in your Sketchbook, the more fabric variety (and success you’ll have) when you “map to fabrics.” So you may want to go to the Fabric Library and add some fabrics in different colors to your quilt. You will find that after a certain number of clicks you’ll have adjoining pinwheels of the same color. Then it’s time to get out your original coloring of the quilt and begin again.